This afternoon, Hoge returned once again to the American Royal but this time to judge the Supreme Heifer Drive. In his speech, he offered more than thoughts on the cattle standing in the ring. 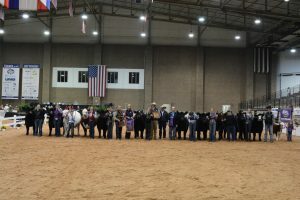 Hoge also commended the young exhibitors in the ring on their hard work, as well as their families. 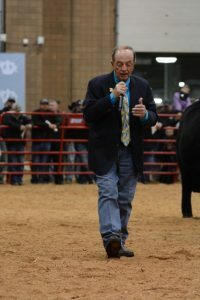 He gave praise to the young livestock judgers in America and especially to the judges who chose the champions saying they all had a similar style. We appreciate Dan Hoge returning to Hale Arena to evaluate the champion females and for giving us wisdom and lessons we will remember for time to come. Congratulations to Chesney Steenhoek of Iowa on exhibiting the 2017 Supreme Champion Female at the American Royal.